Do you know anyone who doesn’t like pizza? Pizza is a dish universally loved all over the world. Whether you order it from your local pizza takeaway, buy it by the slice from a street vendor, or even make it yourself at home, it’s a dish that’s available 24 hours a day all over the world. 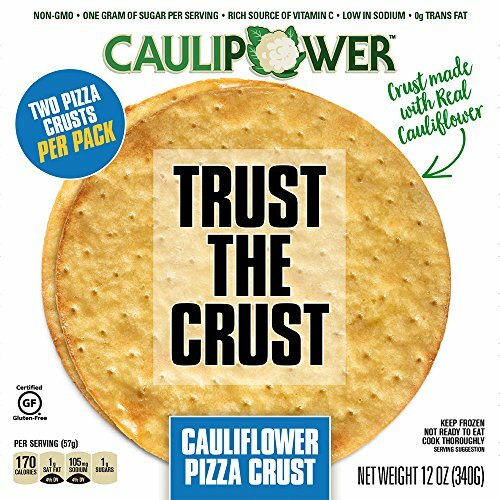 In the western world, meat-laden pizzas have been developed to suit our rather carnivorous palate, but this overload of meaty treats isn’t really necessary. In Italy – the home of the pizza – they are firm believers that “less is more” and vegetables are used as key components for many delicious pizzas. 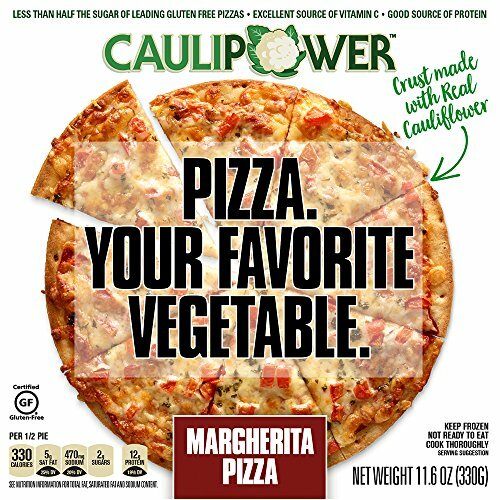 However, people outside of the Italian boarders are starting to wake up to the fact that vegetable-only pizzas can be just as delicious, just as flavorsome and just as exciting as any meat adorned offering – as well as being a darn-sight healthier! Even the base of the pizza is being given a veggie twist. 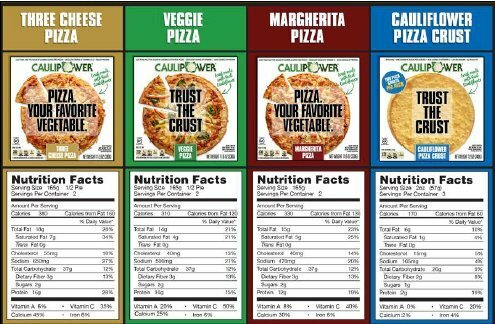 There are plenty of online recipes for pizza bases made from sweet potato, but cauliflower pizzas bases are all the rage at the moment and here’s a fantastic recipe. 1. Add the cauliflower to a food processor and pulse until finely ground. If you don’t own a food processor chop thoroughly on a chopping board. 2. Transfer the pulsed cauliflower into a microwaveable bowl, cover with cling film – poking small holes for the steam to escape – and microwave for 4 minutes. 3. Once the four minutes are up, bring the bowl out of the microwave and allow the cauliflower to cool a little. Then tip the contents of the bowl into a clean tea towel, wrap it up into a tight parcel and squeeze out any excess moisture. 4. Transfer the cooled and drained cauliflower into a mixing bowl, stir in the whisked eggs, the cheeses and the seasoning. 5. 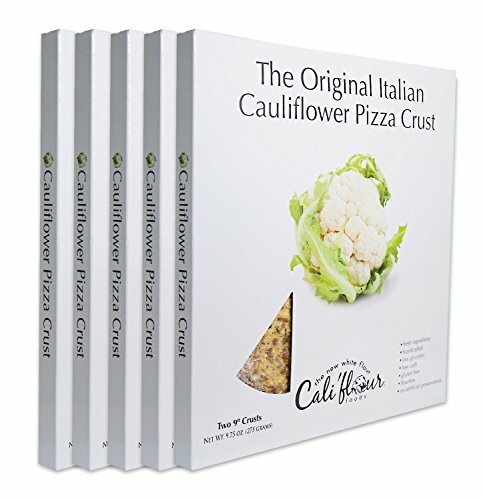 Line a baking tray with baking parchment, pour in the cauliflower mixture and form into the shape of a pizza crust. 6. Spray the top of your base lightly with low-calorie cooking spray, then place in a pre-heated oven and bake for between 12-15 minutes at 425 degrees F (220 degrees C), or until the top has turned a lovely golden brown. 7. Once baked, allow the base to cool a little, then you’re ready to add your toppings. 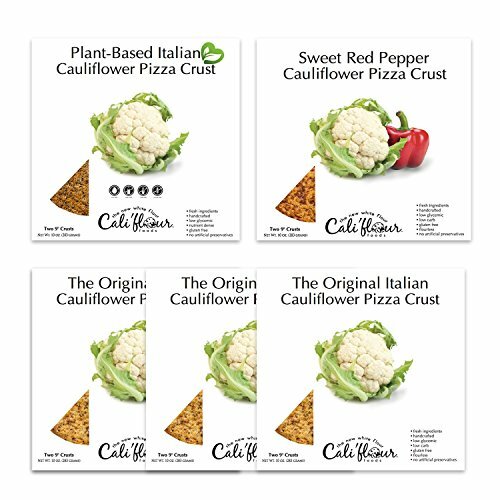 If you don’t feel like making your own crust, you can grab any of these amazing Cauliflower based pizza crusts. You could use a traditional tomato sauce as your sauce, but a mixture of crème fraiche and freshly grated parmesan works well too, as does a few spoonful’s of home-made pesto spread all over the base. * Fresh mozzarella and torn basil, on a tomato sauce base, with a drizzle of extra virgin olive oil. * Chopped spinach, wild mushrooms and sundried tomatoes, with ricotta cheese on a pesto base. * Caramelized onion, sliced apple and crumbled blue cheese on a crème fraiche and parmesan base. * Black olives, crumbled feta cheese and shredded arugula on a tomato sauce base. * Finely sliced zucchini and fire-roasted red peppers, with crushed chili flakes on a crème fraiche and parmesan base. 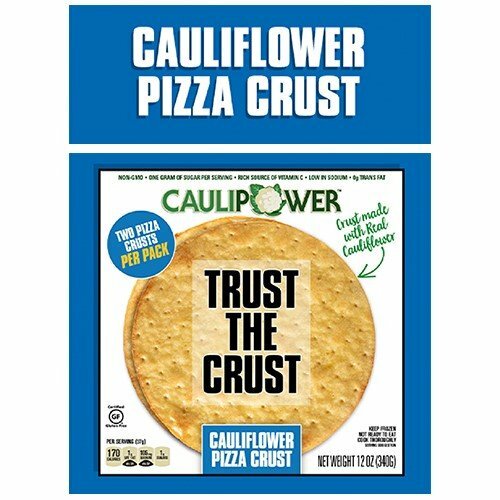 You can combine any of your favorite vegetables and cheese to top your perfect pizza, it really is up to you. If you want an authentic Italian twist, sprinkle your pizza with fennel seeds for the last five minutes of cooking. Enjoy!